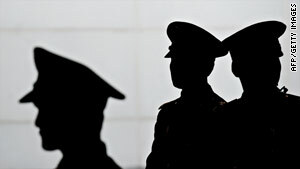 Chinese troops have been banned from creating personal websites. (CNN) -- Military commanders of one of the world's largest military forces may soon be receiving new orders: Matchmake your soldiers. Officers of China's People's Liberation Army are studying how to help their troops look for love following a new regulation that bans soldiers from looking for partners over the Internet, China Military Online, the PLA's online English newspaper, reported Monday. The ban, which came into effect June 15, prevents Chinese servicemen from creating personal websites or blogging in fear that confidential information would be leaked, posing a security threat. "It means soldiers cannot [set up] blogs on the Internet [whether] he or she does it in the capacity of a soldier or not," said Wan Long, the "political commissar" of a regiment in the Guangzhou military area command, who was quoted by the PLA's newspaper. Also off limits: Posting Craigslist-like "lonely hearts" ads, hunting for jobs or making friends online, effectively making all social networking sites out of bounds. "People with ulterior motives may make use of the soldiers' personal information and pose a threat to the safety of the army," Yang Jigui, commander of the Xigaze military sub-command in Tibet said, according to the PLA Daily. Earlier last week, the military sub-command in Tibet held a meeting to discuss the problem of unmarried soldiers and requested some of its units to help them find partners via local civil affairs departments and the women's federation, the report said. "They defend the frontiers most of the year and have few opportunities to make contact with the outside world," Yang was quoted in the report. The article named Liu Qing, a student of a Guangzhou-based military school, who reportedly had a blog about weapons named "Jun Hun," which means spirit of the military. "He deleted the blog, which had attracted a lot of attention, immediately after the regulation was issued," the article said. In February this year, the U.S. military relaxed its social media policy, allowing soldiers access to Facebook, Twitter, YouTube and other social media websites from nonclassified government computers, as long as such activity doesn't compromise operational security or involve prohibited activities or websites. It does, however, allow commanders to temporarily restrict online access to maintain operations security or to address bandwidth constraints. Earlier this year, a soldier with the Israel Defense Force was sentenced to 10 days imprisonment after he posted information about the operation, including the time and place, on Facebook. The IDF subsequently cancelled the raid. Soldiers in the Israeli army are prohibited from posting classified information online, including photographs of military interests. Despite the Chinese ban, China Daily reportedly found a host of personal sites with information on single soldiers, as well as a number of articles containing information about the military that could potentially pose a security threat.